If you've ever had problems with losing tension in your rope while tying a knot, or wasted time untying a difficult knot, here's your hassle-free solution. 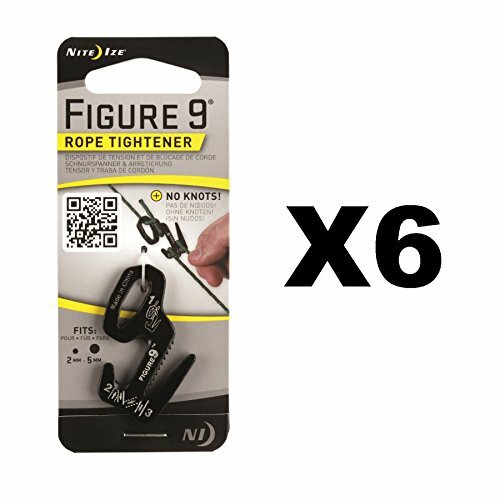 Our innovative, patented Figure 9 tightens, tensions, and secures ropes without knots.The Nite Ize Figure 9 Small makes tightening any line a stress-free task. From bundling fire wood for your next camping trip to tying down trunk lids, this handy tool handles small tie-down jobs quickly and keeps the tension where you need it. Loop your rope through its strategically designed prongs, pull it tight, and it stays that way. A smart alternative to complicated cam-locking devices or bungee cords, our Figure 9 also controls the release of high tension, avoiding sudden and dangerous unloading.